Contains magnesium and other alkalizing minerals from predigested goats milk whey which supports proper pH and colon hydration. Supports liver and gall bladder health. A blend of botanicals, essential oils, enzymes, probiotics, fiber, and alkalyzing minerals from predigested goats milk. Capracleanse is a blend of botanicals, essential oils, enzymes, probiotics, fiber, and alkalizing minerals from predigested goat milk whey. These natural proven ingredients help the body with intestinal cleansing, peristalsis and colon detoxification. Some people who begin on a colon cleansing routine experience some gas and bloating. This occurs when the detoxifying herbs and fibers present in Capracleanse "stir" the intestinal "compost pile" that creates heat and gas. 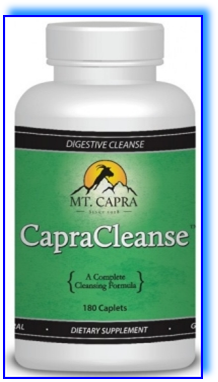 Capracleanse contains herbs known to sooth and counteract gas, bloating, and cramping, such as: Slippery Elm Bark, Marshmallow Root Powder, Rosemary Powder, and Fennel Seed Powder. What should I expect from it? What else can I do to enhance cleansing and detoxification? Drink plenty of pure water. Drink at least eight 8 oz. glasses of pure water a day. Water helps flush toxins from the body to prevent re-absorption. Reduce your intake of red meat during initial cleansing, usually the first 90 days. If available, have some freshly squeezed green juices to add enzymes and assist in greater absorption of nutrients from the live foods that make up the juice. Decrease coffee consumption, as well as sugar and certain carbohydrates. Be sure to eliminate 1 to 3 times per day, do not allow toxic matter to sit in the colon for prolonged periods of time. This can irritate the colonic lining and potentially cause toxic substances to re-absorb. A prebiotic, acts as a food source for friendly bacteria. Aids in activating immune system, contains short chain fatty acids that fuel colonic cell growth, and helps regulate colonic enzyme activity. Soluble, viscous xylan fiber. 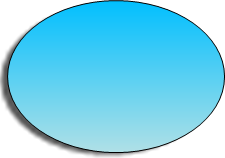 Swells due to water absorption, with consequent increase in stool bulk and stimulation of peristalsis. Soluble fiber rich in Omega-3 and one of nature's richest sources of Lignan. Also, 100% certified organic. Nutritious dietary fiber, binds with water to loosen and form stool. It is a Gluten free, good fiber for sensitive people. Naturally occurring Fructooligosaccharide (FOS) pre-biotic, readily soluble dietary fiber, colonic Ph reducer, stimulates colonic growth of bifidus, and aids in the elimination of toxins. Traditional expectorant, demulcent, emollient, and diuretic. Very high in mucilage. Natural expectorant, demulcent, emollient diuretic and anti-inflammatory. Aids in peristalsis and sooths inflammation of alimentary canal. Used since ancient times to soothe upset stomachs and indigestion and to prevent gas. Also acts as a diuretic and inhibits smooth muscle spasms. It was once an officially listed drug in the United States for indigestion. Ancient remedy for constipation and digestive upset, has a high saponin content and is believed to inhibit absorption of cholesterol. Traditional astringent and stomach tonic shown to ease stomach irritability and aid in the cleansing process by helping to avoid bowel blockage and constipation. Dietary fiber rich in vitamins A & C, niacin, folic acid, biotin and betaine. Betaine functions to protect bile ducts and aids in synergistic bile release. Contains magnesium and other alkalizing mineral which supports proper pH and colon hydration. Pre-digested blend of Wheat, Oat, Barley and Alfalfa juices containing 14 strains of beneficial micro-organisms and active enzymes. Nutrient dense bulk fiber. Contains 8 amino acids and is a rich source of vitamin B12, chlorophyll, and saponins. Traditional Ayurvedic stomach tonic, acts as an alkalizer and anti-inflammatory. A potent anti-oxidant known to alleviate excessive peristalsis through anti-spasmodic properties. : Wild oregano concentrate containing 31 known anti-inflammatories, 8 antioxidants, and four known COX-2 inhibitors. Traditionally used as an ulcer treatment, has strong anti-inflammatory and analgesic effects. It is extremely high in protein digesting enzymes. r: Contains volatile oils that act as potent antioxidants and as smooth muscle relaxers, which help for spasms of the lower colonic tract. Contains water and fat soluble saponins. Also aids in loosening of stools. The above statements have not been evaluated by the FDA. This product is a food, not a medicine. No curative claims are made. Do not give to children under 12 years of age.